Our new book The Beer Lover's Table proudly proclaims that beer is the perfect partner to food - and nothing goes better with beer than cheese. Cheesemonger extraordinaire Ned Palmer of the Cheese Tasting Company and author of the forthcoming book A Cheesemonger’s History of the British Isles pairs up with our co-author Claire Bullen for a night of the finest beer and cheese matches you'll find on the planet. The best beer. The best cheese. The best beer and cheese writers. Together at last. Only at HB&B. 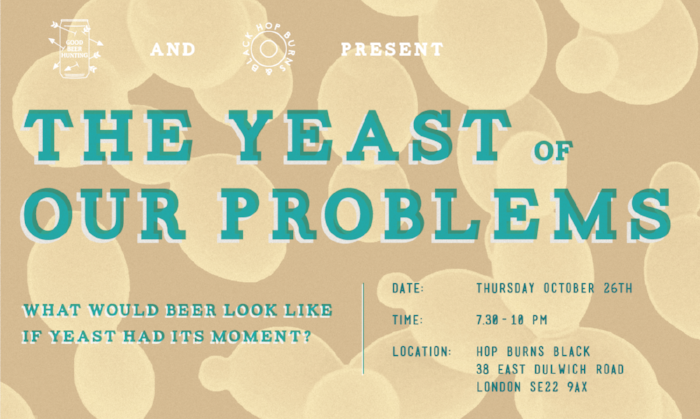 Come join HB&B’s resident beer writer Matthew Curtis – author of our award-winning Fundamentals column – for a tasting that will encapsulate beer from six of the UK’s most exciting up and coming producers. Something he, for reasons unbeknownst to anyone but himself, has coined his “2019 Beer Mixtape”. Expect an interactive tasting session delivered in Matt’s typically ebullient style that will hop and skip from IPA to lager to sour to saison – perhaps even with the odd curveball thrown in. Join us for what will certainly be a relaxed, enjoyable, beer-fuelled evening. Tickets are available here. Some of the finest wines to pass through our shops come from the hand of Ernst Storm under his Storm Wines and Notary Public labels. We're delighted to welcome Ernst to the Peckham shop this Friday night and sample even more of his incredible wines all the way from Santa Barbara County. Ernst will be in the house from 5pm, we hope you'll join us for some of the most delectable wines you'll try this year. Over in Deptford, Nathan will be sharing out a little bit of Storm love too. As part of our extended 4th birthday celebrations, we’re bringing Chilli Karaoke back north of the river as well as our Southern Edition on Friday 16th November at the Old Nun’s Head. It can be simply summed up as the stupidest singing competition in the world! Or as one bar manager put it in an emotional 3am tweet: "Anyone not at the Beer Kat right now is missing out on one of the best pub nights I have ever witnessed. Fact." Chilli Karaoke: North of the River Edition takes place at Signature Brew’s new Taproom in Haggerston (Railway Arch 340, Acton Mews, E8 4EA), with HB&B’s own Lewis Blomfield assuming the MC duties. Expect no mercy. Fresh from the success of our wonderful Duration brewing night last week, we thought we'd better get another one locked in. We are insanely excited to announce that the North Brewing team will be joining us at the end of November for our next HB&Bottle Share. The North folk don't only make some of the best beers out there and win pretty much every award going, they're also some of the nicest folk in the business. John and Christian are busy pulling together a list of beers that encapsulate their beery journey, and we can't wait to see what they have to say. Tickets just £15, available here. These events always sell out and sell out quickly, so don't snooze. It’s our fourth birthday! As well as a month-long series of celebrations (two Chilli Karaokes south and north of the river and a Bottle Share), we’re marking our actual birthday weekend with a plain and simple piss up at a brewery - our fabulous Deptford neighbours Villages. Villages will be serving up their lovely beer, we’ll be serving up great music c/o our third birthday DJs extraordinaire, Ajax and Special Kay, and our good selves, and you - hopefully - will be serving up great company. We’d love for you all to join us. Come on down to sunny Deptford! Two IPAs, two different ways... NEIPA vs Brut in Pressure Drop’s first ever can release, launching exclusively at Hop Burns & Black this weekend! Pressure Drop used Mosaic, Citra and Ekuanot hops in both of these beers. They can be tasted together and compared, or enjoyed on their own. We’re chuffed to have Team PD in the house this Saturday. Tallboy 440ml cans in both stores - the only place you’ll find ‘em this weekend outside Pressure Drop Tap and The Experiment - with tasters from 2-6pm. November is our 4th birthday month so what better way to celebrate than by bringing back the one and only Chilli Karaoke? It’s the stupidest singing competition in the world! For the first time we’ve got North London’s Hammerton Brewery in the house! 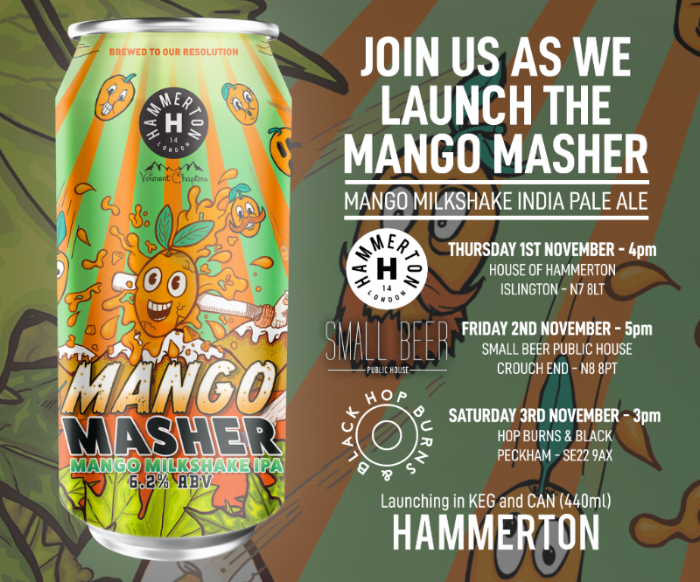 The team are hitting the Peckham shop this Saturday to launch their new Mango Milkshake IPA, Mango Masher. In baseball, the term ‘Masher’ is used to describe a player who consistently hits home runs. Hammerton reckons they’ve knocked it outta the park with this one. Mango masher features 60 kilos of fresh mango, an abundance of oats and wheat, and dry-hop additions that portray stone fruit characteristics - all adding up to a beautifully juicy IPA. Deptford doesn’t miss out either, with free tastings of Mango Masher all afternoon from 3pm. This Saturday, we've got Peckham's own mighty mead makers in the house! Tom Gosnell will be manning the counter at our East Dulwich Road shop with tasters for all, while we'll have bottles open in Deptford for you to try. Light, sweet and effervescent, Gosnells is deserving of all the many accolades it's won. Come along and remind yourself why we all love Gosnells so much. They will be bringing some of the beers that have played such a key role in Bates’ beery and epicurean journey - expect some yeast-driven classics, as well as Duration’s first two own-label beers: Turtles, an American pale, and Bet The Farm, a hoppy continental pale. We can’t wait to try these and listen to Bates chat all things beer in his wonderful Southern drawl. Summer may be nearing its end but the silver lining is that it's time once again for our seasonal natural wine tasting. Back by popular demand, we've coerced the lovely Phil Barnet of Les Caves de Pyrene to find us the most weird and wonderful natural wines he can find for an autumnal celebration. What are natural wines? They're wines made with minimal intervention, chemicals or additives - wines that truly reflect their terroir and that in many cases rip up the rule book. Grab a ticket while you can - these are always some of our most anticipated events so reserve your place now. Tickets are £15 + booking fee, available here. The event takes place at our Peckham/ED shop, 38 East Dulwich Road, SE22 9AX. After a summer break, our Saturday in-store tastings return. This Saturday in both shops we'll have the latest release from Serious Pig on tasting - Snacking Cheese! Get in there before Glenn eats it all... This crazy-tasty snack is made from 100% nine-month-matured Italian hard cheese that’s been baked for ultimate 'cheese toastie' flavour and crunch. And - bonus - it's both gluten and lactose free. Delighted to announce we have persuaded the wonderful Tom Oliver of Oliver's Cider to join us for a night of the world's best cider, right here in sunny Peckham. If you're not familiar with Tom's work, he can be summed up in three words: World's Greatest Cidermaker. He'll hate that, of course, being a man of modest ways, but we're really not exaggerating. Tom is hailed as a cider hero across the globe and as well as making jaw-droppingly good cider at his farm in Herefordshire has collaborated with some of the world's most inventive cidermakers and breweries to truly push the boundaries of tasty beverages. Tom is gathering together some of his favourite ciders - his own and from his favourite producers - for a Cider Salon like no other. Tom's been part of the HB&B story since we first invited him over one rainy Sunday in March 2015 - we always love having him back and this is certain to be one of our best events of the year. Tickets are just £15 plus booking fee, available here. Please arrive at 7.30pm for a drink in the sun before we kick off closer to 8pm. Spring is on its way - yes really - and so it's time once again for one of our favourite seasonal events, our spring natural wine tasting. If you've been to the shop recently, you'll see we've not only expanded our wine selection but that we've given over half of the shelves to the weird and wonderful natural wines that excite us the most. What are natural wines? They're wines made with minimal intervention, chemicals or additives - wines that truly reflect their terroir and that in many cases rip up the rule book. We like to think of our favourite natural winemakers as we do our favourite brewers - rogueish and renegade, fun-loving and irreverent, pouring their personality into their wines. Come and try our new season favourites (the pic above is only indicative!) with our favourite natural wine expert Phil Barnet from Les Caves de Pyrene. These tastings are always one of the most popular events of the year, so get in quick to reserve a ticket. Tickets are just £15 + booking fee, available here. We love to support local business and were very excited when Modestas from Brockley cidermakers Telegraph Hill Cider stopped in with some samples recently. Modestas and his partner come from a wine-making background in Lithuania and have applied this knowledge (along with cider skills learned from the best) to making cider right here in SE London. 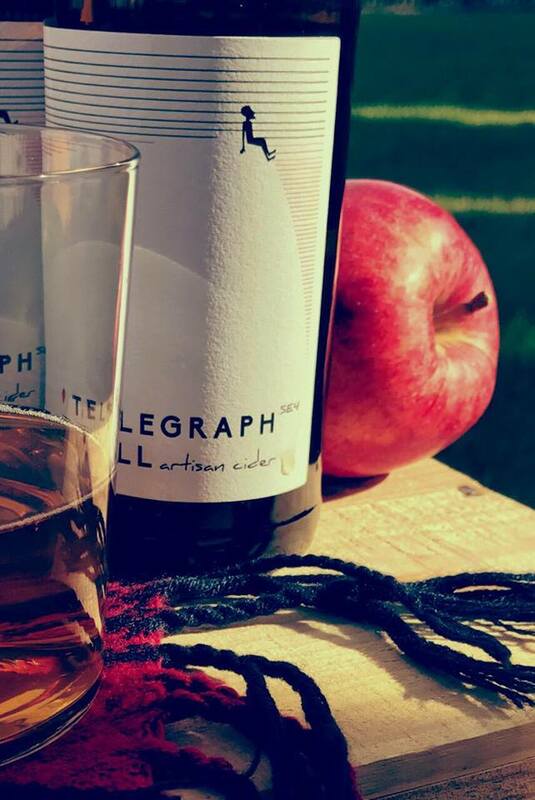 Telegraph Hill Cider uses Kent dessert fruit and various cider apple varieties matured on the lees for almost a year before bottling. The result of their endeavours is a delightfully crisp medium-dry cider that is the perfect spring (and summer/autumn/winter) tipple. Come down and try some this weekend - Saturday, 4-6pm. GOOD BEER HUNTING SAYS: We live in a hop focused beer world. There’s nothing wrong with this of course, at GBH we like our pales and IPAs as much as anyone else. We do worry, however, that some of the other wonderful ingredients which make up our favourite beverage too often get overlooked. Tickets are just £16.50 (plus booking fee) per person—however if you’re a member of the GBH Fervent Few subscriber community you'll get a code for 10% off the ticket price. When Philippa from Fatty's Organic Spirits popped in with a sample of her new gin late last year, we bought a case on the spot. This tasty, tasty gin was created in Dulwich and - aptly, given that Dulwich historically means 'the meadow where dill grows'. - is infused with dill. It's made to the highest organic standards, using the finest organic grain and botanicals, and this all results in a 10/10 yum rating. We're looking forward to sharing it with you. Come on down to the shop, meet Philippa and try her lovely gin! So excited to have one of our favourite sauce producers in the house this weekend - the amazing Baj of Baj's Blazin' Hot Sauce. Baj and sister Jot make delicious Punjab-inspired sauces in sunny Greenwich - holding down day jobs during the week and cooking and selling sauces all weekend (read more about Baj in this recent Evening Standard piece). We're delighted we've managed to prise Baj away from the kitchen to come join us in the shop and know you're going to love her sauces, if you haven't tried them already. We'll have a full re-up on the range, which is looking even better than ever too with a slick new redesign. See you down the shop! Villages Brewery is run by Louis and Archie Village, officially the nicest brothers in brewing who are making cracking beer from a couple of railway arches in Deptford. We've loved watching their beery dream become reality over the past year and are stoked to have enticed them over to the shop to share their beers with you. After brewing our third birthday collab with the Cloudwater crew last year, as is customary we headed out for a few beers, En route, we popped into Track's brew house where the team had just finished their first bottling run on Cloudwater's former bottling line - and we got very excited indeed. Track's 2018 output has been nothing short of spectacular - Sonoma is up there with the best 3.8% pale around right now and we've been loving their other small pack stuff too. All of this is a long-winded way of saying we're bloody delighted to have wooed them down to the dirty south for what promises to be a riotous in-store tasting on Saturday 24th. We'll have a bunch of brewery-fresh releases on shelf and on flagon-fill, and of course on the counter for you to try. Low alcohol options are getting loads of press at the moment - research data shows that low-ABV sales are up by 30%... But you don't care about that. You just want great tasting beer! So we're stoked to invite the guys from one of South London's newest breweries, Small Beer Brew Co, along to the shop on Saturday 17th. They specialise in low-strength beers - their Lager and Dark Lager (checking in at 2.1% and 1% respectively) pack loads of flavour into such tiny ABVs. Don't believe us? Find out for yourself when Small Beer hits the shop floor armed with tasty samples for all. If we were in Manchester we'd be heading along to Cloudwater's barrel store this Wednesday to raise a glass to this modern-day icon of UK brewing on the occasion of the brewery's 3rd birthday. Since we're not, we thought we'd bring the party to you - or at least the beer. Big cheers to all the good folk at Cloudwater - many happy returns and we hope you push that boat out good and proper! It's another double header this weekend, with both a Friday and Saturday tasting lined up for pre-Xmas imbibing pleasure. On Friday from 5-7pm, we've got our good friends from Gipsy Hill in the house with their brand new can range - Beatnik, Southpaw and Hepcat all freshly canned and tasting bloody brilliant. On Saturday from 4-6pm, we welcome back the top chaps of Sweetdram with their small batch liqueurs - Escubac Apero and Smoked Spiced Rum. These tastings are always extremely popular - nice guys, great booze, what's not to love? It's our birthday week, and if a massive big party at Brick Brewery this Friday night and three new anniversary collab beers with Cloudwater, Fourpure and Brick weren't enough, there is yet another beery treat coming your way. It's our final Hop Burns & Bottle Share for 2017 with special guest Paul Jones, co-founder of Cloudwater Brew Co.
Paul needs no introduction. As the MD of one of the most exciting breweries on the planet, he's propelled Cloudwater to legendary status since it launched in March 2015. It's the only UK brewery ever to have made the Ratebeer Top 10 list and has helped to radically change the way UK drinkers think about beer. Paul's selected a range of beers that help tell his beery journey - amazing beers accompanied by top tales from one of UK brewing's finest raconteurs. It's short notice but there's no doubt this event will sell out and we're picking it to be one of the jolliest nights in HB&B history, so book your spot now. Tickets are just £15 plus booking fee. Hop Burns & Black turns three! We're turning three! Can you believe it? We're celebrating with a good old knees-up at Brick Brewery, where we'll launch our new anniversary collabs, the HB&B Hoppy Trinity: HOP is a succulent DDH NZ Pale brewed with Cloudwater Brew Co; BURNS, a Mango & Habanero Red Ale brewed with Fourpure; and BLACK, a Blueberry & Vanilla Stout brewed with Brick. Join us for good times, great food c/o Slow Richie's, top tuneage c/o Hop Burns & Boogie and pals, and amazing beer! After=party takes place from 10pm til late in the Four Quarters Basement further down Rye Lane. Give it up for London hip hop legend Rodney P, who's collaborated with Signature Brew on their latest beer, Live Up!, a Bourbon Oak Golden Ale. We've got the Signature Brew and Tru Thoughts crews in the house AND on the decks this Friday night, with tunes and beer flowing freely from 5pm. There'll be a bunch of Tru Thoughts vinyl for sale and, as an added bonus, we've also got Liverpool party legend Joe Florek from Howl At the Moon joining us with his brand new Sound System Sauce and a bag full of 7" vinyl. It's going to be awesome fun. Live Up your Friday! In a world of ever more hop forward beers, are we neglecting to give beer's most eclectic ingredient the kind of attention it deserves? In the second of our Fundamentals series, we invite you to join Good Beer Hunting’s UK Editor Matthew Curtis and our fabulous food and beer writer Claire Bullen as we taste our way through four beers that derive their key flavours from yeast. You'll get to enjoy four yeast (and bacteria) driven styles: Brettanomyces fermented Pale Ale, Belgian Tripel, German Weizen Bock and Belgian Lambic/Gueuze, along with a small but mighty food pairing from Claire. This event will sell out very quickly so get your skates on. Tickets are just £16.50 (plus booking fee) per person – however if you’re a member of Good Beer Hunting's Fervent Few subscriber community, you'll get a code for 10% off the ticket price. We're proud to present another exciting Saturday tasting with two local favourites, Peckham's own Brick Brewery and Kanpai London Sake, who've got together to produce something rather special - Mottainai Sake Beer. Mottainai (もったいない) is a Japanese term that conveys a sense of regret with regards to waste - for example, the expression "Mottainai!" is an exclamation for when something useful, such as food or time, is wasted, translating roughly as "What a waste!". In this case, a base beer was made, then the kasu, or "waste" product from sake brewing (containing rice, live yeast and koji) was added. The result is a dry, orange-hued beer with notes of umami (savoury) and citrus - and we can't wait to try it. We're delighted to launch this at the shop on Saturday from 4pm. See you there. It's autumn, it's grey and dreary and we could all use a little fire in our bellies. Thank goodness, then, for the good folk at Umbrella Brewing who are bringing their fiery ginger beer to the shop this Saturday. Umbrella Brewing Ginger Beer is made right here in sunny London and features rich molasses flavours supported by the perfect balance of sharp citrus and a subtle hint of malt. It's all natural - fresh pressed ginger, hand squeezed lemon and demerara sugar... Thirsty yet? Oh, and did we mention it's got booze in it? Join us on Saturday for an in-store tasting from 4pm. Rambunctious monger Ned Palmer, head honcho of the Cheese Tasting Company and guru of milk-based morsels, returns to Hop Burns & Black with an event that aims to unite us through the medium of cheese and beer. Never Mind The Brexit brings together the tastiest international cheeses and pairs them with the best of British beers in a spirit of internationalism. Five great cheeses, five great beers, and you'll get to vote for your favourite in a non-binding advisory referendum. It's time to take back control - or at least take back the cheese platter. Tickets are £20, available here.